I have a view of a giant weeping sequoia just outside of my window. It’s a sequoia-as in the famous giant redwood trees of California fame. They’re some of the oldest and certainly tallest living things in the world. The one I see every morning, however, is weeping; so botanically, it’s weirded out and it isn’t that large and I’m near sure I’m older than it too. It happens to be smack dab in the middle of my view of the world every morning too. If you can imagine a front window as a famous painting, this tree would be awkwardly front and center. So at least technically speaking, it should be hard for me to miss. Which is why it makes me suddenly noticing it all the more strange. But weeping sequoias aren’t always sad and weeping. Its central leader, the part of the plant say on your Christmas tree where the star (or angel) is often perched, is a horticulture Rebel. When young, it grows upward and onward like any other neighborly tree. Just a few years later though and the central leader can suddenly turn away from the sky, grow entirely horizontal for a year or three, and then turn again toward the sky. This gives the living thing often a 90 degree elbow as it continues to grow. Those gardeners who enjoy predictability in their garden (think Starbucks) may not enjoy a weeping sequoia. Alternatively, if a new day brings a brand new world to you (like investing in tech stocks) then this tree may have potential. 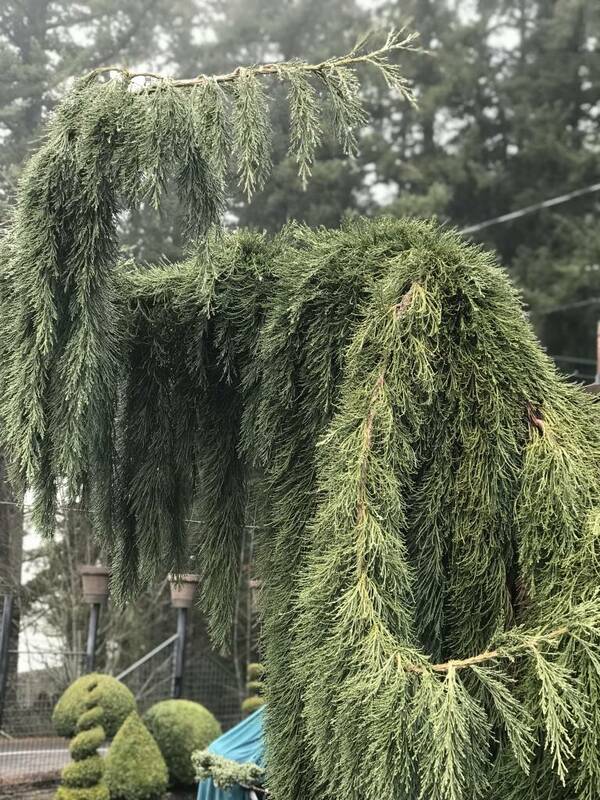 So, seeing it everyday but suddenly noticing it I had to ask no one in particular, “When did my weeping sequoia suddenly twirl in an almost complete circle and then split into two leaders going opposite directions?” How did that long and slow progress happen right before my very eyes? My only explanation is that when I gaze out my window every morning theres a lot more going on than I care to realize. Am I looking but being distracted? Checking cars going by or neighbors walking past? Could I be looking for distractions instead of what is currently present? So it was a grey and coldish morning when I caught up with fellow gardener Linda at the coffee bar in the nursery. She had brought baked goods with her, like she often does (and which we can’t help but enjoy). On that particular morning though, she had walked to the nursery. This, after her fight with cancer, and a bad fall and two separately broken hips (a month apart) as well as all the treatments and missed work and insurance worries and healings and frustrations. We had to stop for the moment in the fast rush of things to realize this bit of progress was a major achievement. Progress it seems, doesn’t always come proudly and loudly with banners and a marching band like we would want. But rather, I’ve noticed, it sometimes sneaks in under our gaze, unnoticed, and in the quietest of moments. And often it’s agonizingly slow and certainly under-appreciated. I’ve learned to be more careful. Like my awkward weeping giant sequoia, growth and the steady push towards progress bends toward the light. Sometimes its horizontal, sometimes upward and occasionally it splits both ways. Either way, it will be up to me to pause to notice, and to celebrate those moments more often. Bio: Jonn Karsseboom dispatches (mostly helpful) gardening advice daily. When she’s fighting a tough battle and being so brave about it. I wish i knew her. Bravo Linda!